But the issue is that in-network middleboxes cannot inspect encrypted traffic, and users are not willing (rightfully) to compromise privacy and security. 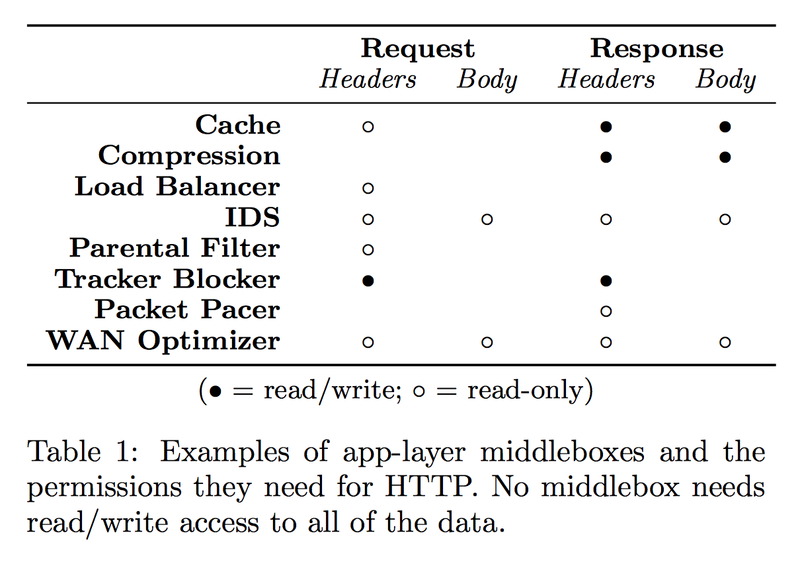 One solution is to let the middleboxes perform MITM attack and decrypt the traffic, inspect it, and the re-encrypted. But this is not ideal as it gives middleboxes unrestricted access to all users' traffic. 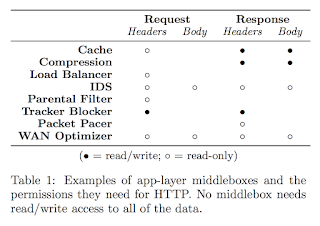 The speaker argued that such unrestricted access is not necessary and middleboxes can actually perform their functionalities with limited view into user's traffic. The speaker then talked briefly about TLS and what provides (authentication, secrecy, and integrity) and how TLS + middleboxes is problematic as there is no mechanism to verify middleboxes, no secrecy guarantees past the middlebox, and how middleboxes have unrestricted read/write access. The speaker emphasized that mcTLS does not support transparent middleboxes, as in both end points are aware of the middlebox and the middlebox ONLY received a key for a context if both ends agree on that. Finally, the speaker talks about mcTLS's performance and its overhead in terms of data, cpu, and time. mcTLS has a few Kb of data overhead and might hurt when getting small objects. In terms of time, it has the same number of round trips as TLS. Q: Does mcTLS require clients to have public keys? Q: How do you authenticate clients then? A: We decided to leave that to the end point. They have to both decide if they want that middlebox there. Q: This seems to work well in theory, but it requires all parties to be updated! Q: Middleboxes will never adopt this! I don’t see what’s the financial win? A: Some of these mbs are helpful to clients and costumers might want this! Q: there is 2012 IETF proposals, (? ), didn’t really progress behind the draft. Have you seen it? how does it compare to your solution? Q: is there a solution for client or server to say I want to middle box to interfere with my traffic?